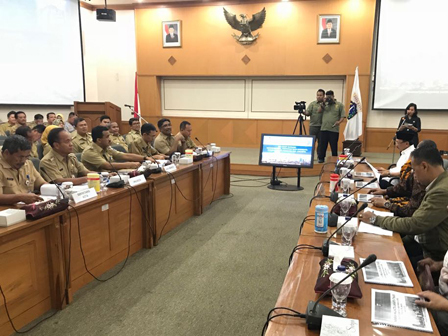 City DPRD's Commission A, held work meeting along with SKPD/UKPD members under East Jakarta Administration, Tuesday (4/3).
" We are here to directly monitor the budget absorption"
City DPRD's Commission A Chairperson, Syarif disclosed, in the meeting, his party wanted to know the budget absorption under East Jakarta up to April 2018. "We are here to directly monitor the budget absorption," he expressed. He furthered that the 2018 General Budget Policies Amendment and Provisional Budget Ceiling and Priorities (KUPA-PPAS) is targeted to be drafted by the end of the upcoming May. He hoped that East Jakarta Mayor and his ranks could resolve various obstacles that trigger low absorption. "Which is why we want to know obstacles faced deeply to be resolved together," he exclaimed. East Jakarta Mayor, Bambang Musyawardana conveyed that his party has absorbed Rp 8.89 percent or Rp 270.3 billion of total budget injected by Rp 3.04 trillion through this year's APBD. "Indeed, it's still under process. But we're optimistic the result will be optimal in the end of this year," he stated.